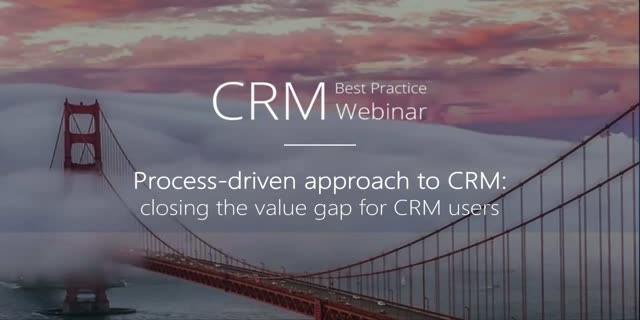 Bpm’online invited Rebecca Wettemann, one of the leading CRM analysts and VP of Nucleus Research, to share her expert perspective on the values of a process-driven approach to CRM and how it helps organizations streamline business operations and boost rvenue. Companies that have employed a formal process observe 18% higher revenue than companies that haven't. Moreover, 43% of the companies observe an increase in efficiency after two months of integration with business process automation software. Therefore, organizations that are seeking solutions to help them adapt to an ever-changing business environment need to consider building formalized business processes that comprise a set of well-thought-out actions to enhance the customer experience and cut operating expenses. During the one-hour webinar, Rebecca Wettemann will highlight the key values of a process-driven approach to CRM and explore the challenges and best strategies for planning, budgeting for, and executing on a next-generation CRM deployment. Participants will leave armed with a checklist for objectively evaluating their current CRM successes, identifying the best opportunities for improvement, and presenting a credible business case. Don’t miss out on learning how a process-driven approach to CRM helps businesses gain a competitive advantage by enabling them to streamline business operations, improve customer experience and better engage with customers. Bpm'online invites you to a free webinar “The future of customer engagement: accelerate transformation” with Paul Greenberg, one of the most influential CRM industry experts, as a guest speaker. According to a recent study, 84% of businesses claim that Customer Engagement will overtake productivity as the primary driver of growth. Bpm’online has invited Paul Greenberg, one of the most influential CRM industry experts, to share his vision on the future of customer engagement and how intelligent technology will help organizations more effectively fulfill expectations of digital-savvy customers. ●Best practices in building a customer-focused digital organization. ●How to align all business processes around your customer to drive customer loyalty. ●How understanding customers' needs, expectations, and behaviors helps close the gaps in performance, personalization, and trust. ●Future outlook on customer engagement success. ●Technologies to enable faster transformation across various business units. Don't miss out on hearing Paul Greenberg sharing his expertise on how to take Customer Engagement to the next level! Bpm'online invites you to a free webinar “Adding intelligence to your Digital Transformation process: driving innovation and flexibility” with Brent Leary, one of the most influential CRM industry experts, as a guest speaker. Today 87% of businesses treat Digital Transformation as their competitive opportunity, however, only 10% of companies describe themselves as fully digital. Bpm’online has invited Brent Leary, one of the most regarded industry experts, to share his expertise on how to tackle the challenges of Digital Transformation and how intelligent technology impacts the future business landscape. • Best practices in strategy execution: how to upgrade your Digital Transformation strategy with Artificial Intelligence. • How companies will have to adjust and adopt new ways of thinking to stay connected with customers and serve them moving forward. • Why AI is destined to change how businesses engage with customers forever and how to respond to this change. • How intelligent technology can enrich your customer engagement strategy by providing profound insights and better workflow visibility. • How today’s intelligent CRM solutions are driving growth for organizations from various industries. Don’t miss out the opportunity to acquire extensive knowledge on how to accelerate your time-to-strategy execution with intelligent technology powered by AI from one of the most regarded industry experts! Bpm'online invites you to a free webinar “How to win the battle for customers in the age of new banking with smart tech tools and refined processes”. Recent studies reveal that the average cost per customer interaction in a traditional banking branch is almost 8 times higher than in a respective digital channel. During the webinar, Michael Rooney will shine a light on the gaps in traditional banking that limit their abilities to attract and retain next-generation customers. He will demonstrate how an agile CRM platform can help banks and financial services companies outperform their competition and set them up for success in the age of new banking. • What success factors can be drawn from a neobanking model? • Key ingredients of an optimal customer journey with your bank. • How to smoothly integrate digital innovations with traditional branch system? • How smart tech tools minimize service time in branches and contact-centers? • Steps to deliver a superior customer experience and boost sales results in banks. Don’t miss out on learning how bpm’online can help banks and financial services organizations exceed client expectations and win leadership in the market. Recent studies show, that 75% of consumers say they would spend more money with a company because of a positive customer experience. How do investment in next generation CRM help businesses enhance customer journey? Bpm’online has invited Leslie Ament, SVP Research & Principal Analyst at Hypatia Research Group, to share her expertise on how next gen CRM technology can help stakeholders transform their businesses into truly customer-centric enterprise thanks to advanced customer journey management. During the webinar, Leslie Ament will talk about why tech-savvy, modern consumers are no longer impressed with the current personalization level. Today, enhanced customer journeys should start with a deep understanding of the customer behavior and preferences, which is a backbone of enhanced customer experience. All investment in customer engagement solutions should reduce the customer's effort, be seamless, and encourage interaction via all preferred channels while providing stakeholders analysis and multi-channel visibility into customer preferences, behaviors and purchases. •Improve enterprise level operational business processes. •Guide marketers, sales professionals and contact center agents on best practices for customer engagement and/or offer management. •Redesign workflows and use of business process automation to configure and/or automate repeatable processes. •Realize that customer engagement intelligence doesn't reside only in a CRM application: it lives throughout and beyond the enterprise. •Transform into a truly anticipatory customer-centric enterprise by replacing inside-out business processes (resource optimization) with purpose-built business processes designed from the outside-in (customer focused). Recent studies demonstrate that aligned organizations achieve an average of 32% annual revenue growth while less aligned companies report an average of 7% decline in revenue. What are the key milestones on the way to becoming an aligned organization? Bpm’online has invited Paul Greenberg, the author of the best-selling ‘CRM at the Speed of Light’, President of The 56 Group, LLC, to share his expert perspective on the values of aligning marketing, sales and service teams around the right processes and technologies. During the webinar Paul Greenberg, frequently referred to as “The Godfather of CRM”, will be talking about how interconnected marketing, sales and service processes can help shape seamless customer experiences that moves inquiries from leads, to deals, to loyalty. One of the opportunities to connect the dots between marketing, sales and service is to use CRM technology that is designed to unify all customer-facing processes. This involves many things: shared goals, common milestones and metrics, streamlined business processes, and smart technology investments. Well aligned sales and marketing teams can account for a 15% increase in win rate. 1.How to unite all teams to work toward a common revenue goal. 2.How to leverage your customer journeys to identify and fill the gaps across the funnel and prevent sales pipeline leakage. 3.How to help your marketing, sales and service teams adapt to the new initiatives faster when the company’s processes, products or services change. 4.What are the key benefit of connecting departments and data with one technology, on one platform. 5.How to drive a more streamlined customer experience and ultimately, higher win rates. Digital transformation requires organizations today to be both bold and agile to keep up with the pace of the market shift. Bpm’online invited Rebecca Wettemann, a world-famous CRM analyst & VP of Nucleus Research, to share her expert perspective on values of the process-focused approach to CRM during the one-hour webinar. Recent studies predict that by 2017 about 70% of successful digital business models will rely on dynamic processes designed to evolve with customer needs. •Deficiency in pre-built customer-facing processes and difficulty in modifying them. •Customization of business processes takes too long. •Specific technical expertise is required to modify processes and better align them with strategic imperatives. Does your CRM allow for changing customer-facing processes with minimum efforts in order to support your business growth? How can you make the business case for a more dynamic CRM strategy? • Benefit from fast and easy process adjustment – no complex and time-consuming configuration by IT specialists. • Timely adapt customer-facing processes in response to the rapidly changing business environment. • Consistently test, modify, and improve business processes. • Build the business case for transforming your CRM processes. Bpm’online is a premium vendor of process-driven cloud based software for marketing, sales and service automation. The beauty and core value of bpm’online products are the out-of-the-box processes that guide users through the most effective actions to accelerate results. Users love bpm'online's engaging interface with its social look and feel, free from redundant information that keeps them focused on what's relevant.